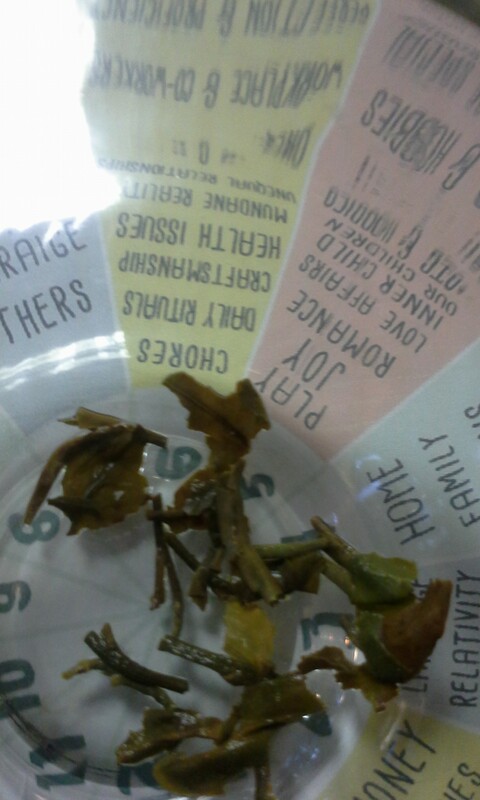 As the tea I chose for Tarot Illuminati creator Erik C. Dunne‘s zodiac tea leaf reading steeped, two of the leaves floated at the edge of the cup, by the house of Leo, emphasizing “play” and “joy”. I selected Darjeeling because it is associated with Erik’s sun sign, Aquarius. When the cup was ready to read, I began near the rim and worked toward the bottom. Someone connected to Erik’s early home life seems to have inspired or have involvement in his creation of the Tarot Apokalypsis, his latest venture, and the subject of the reading (He shares updates on his project here). 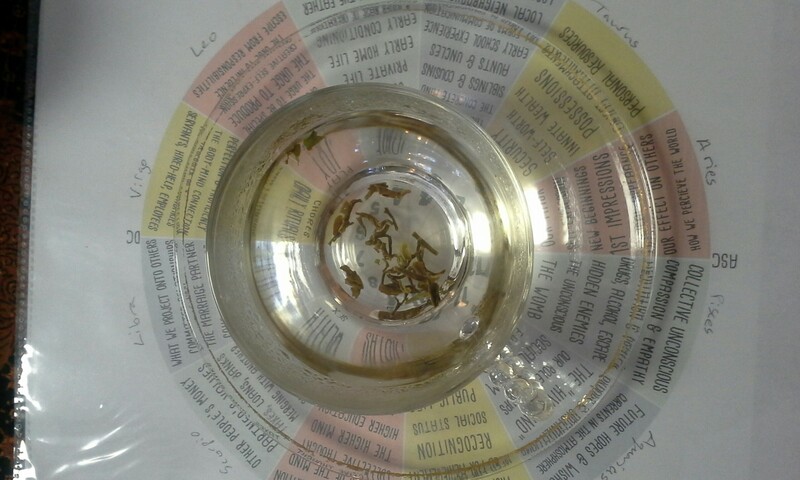 While birds seem somewhat common in tea leaf readings, the one I saw in this reading seemed to be gathering materials for a nest. He had a sense of wisdom around him, and his head is in Virgo and Leo. The beak is in Virgo, implying Erik’s able to communicate tasks and chores, sing them into the world. An organized (Virgo) and playful (Leo) mind is helpful for the massive job of creating a Tarot deck. If you look below the word “chores”, you will see the head of a very confident bird gathering materials for a nest. I interpret leaves at the bottom of the above photo to have the pattern of a high heel shoe with a wing for Mercury. Style, grace and speed come together. A dragonfly, with those bright yellow-ish wings, rests atop the wing on the high heel.The shoe rests right at Aries at the bottom of the cup. The project moves forward with poise and care.Above the toe of the shoe, on top of the numbers on the paper under the cup, is a leaf that looks like the profile of an eagle or falcon head. It faces the shoe. I feel Erik will find independence (the eagle) in the work he’s established, and that his deck will become an accurate tool (the falcon) for Tarot readers. I found a crocodile in this cup, too. Its tail curves up toward its own body is near the word “relativity”, the house of Gemini. The head is near “home” (Cancer) and its jaws face the wise bird who works on his nest. The jaws are in the house of Cancer, which is ruled by the moon — intuition is a tool for survival. The crocodile is a favorite animal of mine. When I was young, a small rubber toy crocodile scared me so much that I wouldn’t step over him. My parents would lay him in front of any thresh hold, such as the laundry room, that they didn’t want me to cross. Now I find them fascinating — they have been around since the dinosaur ages. And my favorite cartoon character, Pinkie Pie on My Little Pony, has a toothless alligator as a pet. I asked Erik if the crocodile held significance for him, and he felt it best to rely on my interpretations. With this in mind, I feel the crocodile asks that he be mindful of how much his work on the deck effect his time at home. 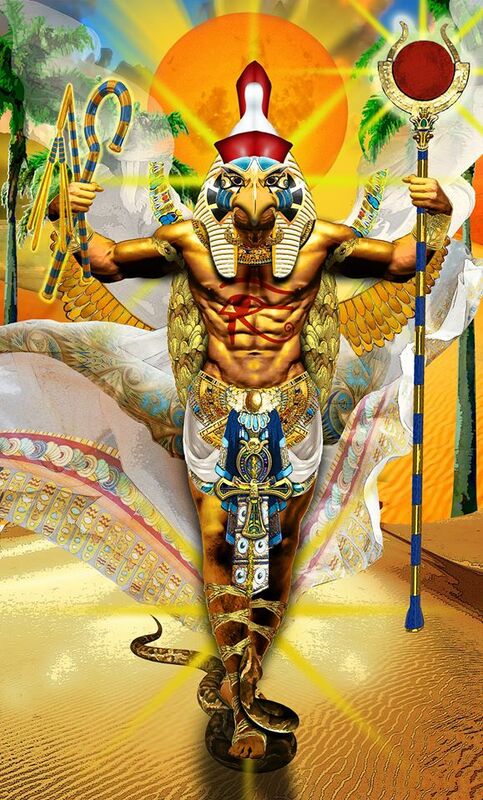 Also that his experience making Tarot Illuminati establishes a sort of ancient survival know-how and he will feel triumphant as he continues work on Tarot Apokalypsis. His desire to communicate (Gemini) through his art (Cancer, the home, the root of the reading and in many ways the heart of his professional identity) will not extinguish, but flourish. Both birds and the crocodile in Erik’s tea cup bring to mind Egyptian myth. And they don’t feel a far cry from the King of Wands in Erik C. Dunne’s forthcoming Tarot Apokalypsis, seen here. Please visit my website for fresh blogs and to purchase a Tarot and/or tea leaf reading. Tabitha Dial is a tarot, tea leaf reader, and creative mentor in Lexington, Kentucky. She facilitates the Create your Fate (Tarot and more) Meetup. Her poetry has appeared in articles onSpiralNature.com, in “Arcana: The Tarot Poetry Anthology“, and in “Tarot in Culture” Volume Two.